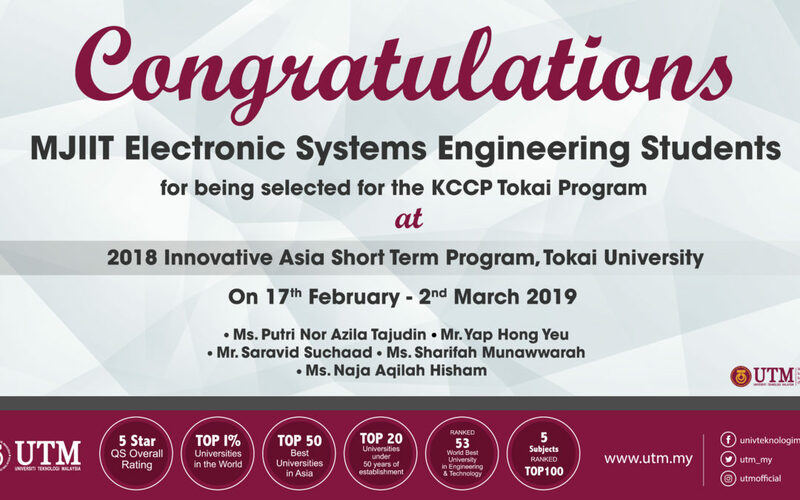 Kuala Lumpur, Jan 22 – Five of MJIIT students from Electronic System Engineering Department, ESE have been selected for the 2019 Innovative Asia Short Term Program, Tokai University (KCCP-Tokai program) on 17th February to 2nd March 2019 at Tokai University, Japan. The five successful students are ms. Putri Nor Azila Tajudin, Mr. Yap Hong Yeu, Mr. Saravid Suchaad, ms. Sharifah Munawwarah and Ms. Naja Aqilah Hisham. The two weeks program is organized by JICA Yokohama Center (YIC) Japan in partnership with Tokai University. The following expenses will be provided for the participants by JICA which include allowances for travelling, accommodation, meals, living expenses, outfit, and free medical care during the program.